Chelsea vs. Tottenham Hotspur : 15 April 2012. The stakes were high. 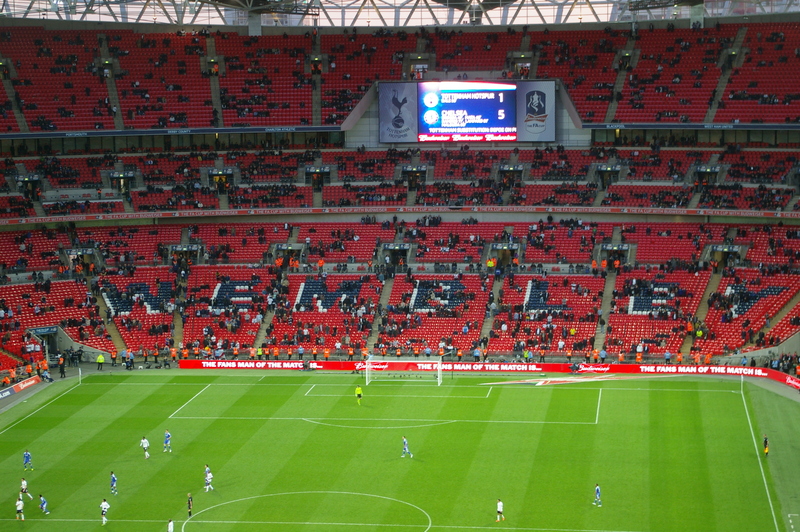 Chelsea versus Tottenham in the semi-final at Wembley. In our lives as Chelsea supporters, they really do not get much bigger than this. There were sub-plots aplenty for this game, but the simple truth was that revenge and retaliation was in the air. With our dominance over Spurs in the league since 1990, it is hard to believe that there is any revenge left to seek, but scratch the surface and there is plenty. Let’s talk about the F.A. Cup Final of 1967; the first (and incorrectly dubbed) “Cockney Final” and a 2-1 loss. Of course, none of my friends were present at that one, but the memory is there in our collective psyche. There is 1982; the Quarter Final this time. Chelsea were a struggling second tier team and Spurs were the F.A. Cup holders, full of top players and swagger. A Micky Fillery goal gave us hope before the break, but the visitors agonisingly came back to beat us. I remember listening at home to the action on the old BBC Radio Two, staring at the swirls on the living room carpet, living every horrible minute of Spurs’ gut-wrenching come-back. It was as horrible a defeat as I can remember. And then there was 2008 and the Carling Cup Final defeat. This match was horrendous; a Drogba free-kick against the run of play, but then the eventual Spurs comeback and a 2-1 loss. Spurs out-sung us completely on the day; and it is that memory that haunts me. I actually hated vast swathes of our support on that Sunday afternoon. It left me wondering about my connection with the club, the fans, the whole nine yards. How can I support the same team as so many Chelsea supporters who simply don’t live by the same rules? I was up early – just after 7am. The sun was out, there was a slight frost. There was an incredible air of anticipation. This seemed like the F.A. Cup final itself. “I said don’t fight against no colour, class nor creed. “Equal rights and justice for one and all. I wondered if the Stiff Little Fingers’ mantra could be suspended for a few hours as we renewed hostilities with Tottenham. We safely parked near The Lillee Langtry at West Brompton and caught the tube to Edgware Road. We reached The Duke Of York at about 1.30pm and a few of the lads were already there. We stayed three hours. We have been frequenting this corner pub since that Carling Cup game in 2008 (the defeat obviously didn’t deter us) and we usually sit outside, soaking up the sun’s rays. On this occasion, we were all inside; there was a bitter chill to the air. I limited myself to two pints of Kronenburg and found it hard going. I have driven to all but one of the games this season and I had reached frustration point; I longed to be able to free the shackles and dive in to more lagers, but knew I had to limit my intake. The F.A. had set the 6pm kick-off time and I had a long night ahead. As the others gulped their lagers, I sipped mine. The chat swirled around me and more mates arrived. We talked briefly, and fitfully, about the game. There wasn’t a mood of optimism in the camp. Ed was realistic; the game could swing either way. Rick Glanvil, the respected club historian, briefly appeared and mentioned that a couple of Spurs mates were equally sombre about the game. This was reassuring; it reminded us that they hadn’t been performing as well as earlier in their season. Daryl mentioned that Tottenham had lost their last five F.A. Cup semi-finals and this brought a further moment of cheer. However, we spoke about the Barcelona game too; there was not a glimmer of hope for that one. We all knew it. We’re not stupid. We set off at 4.30pm and caught the 4.55pm train at Marylebone. The train was packed with Chelsea, arriving from the south, and the carriage was soon rocking with noise. I had a few moments to myself outside the stadium. The skies were clear and the sun lit up the shining steel of the stadium. I walked around to the front, underneath the Sir Bobby Moore statue. I took the inevitable batch of photographs of the glinting steel arch which dominates the surroundings. The Chelsea and Tottenham fans were boisterously walking up towards the stadium from the Wembley Park tube station to the north. This was our tenth visit to the new Wembley and we were allocated the east end for only the third time; again memories of 2008. I ascended the elevators and was met with a packed concourse doing “The Bouncy” amid a sea of beer. We had seats behind the goal, just two rows from the rear. The stadium took an age to fill up, but what a sight it was. The tiers rose up to the sky and the pitch seemed ridiculously small. The new Wembley lacks something though; I can’t put my finger on it. Maybe it just lacks charm. To my right; Parky, Milo, Simon, Rob, Daryl, Ed, Alan and Gal. The tickets only cost £30 – no complaints there. To my left were Steve and Darren Mantle. Mick the Autograph King was in the row in front. As the kick-off time approached, I surveyed the scene. To my annoyance and embarrassment, it was clear that we hadn’t sold all of our tickets. A large block of around 300 were completely empty down to my left. There were odd areas dotted around the Chelsea section unused. This sickened me. Again, I conjured up thoughts about our size as a club. Steve and I chatted about Chelsea and Spurs. When I was growing up, Arsenal and Spurs were the two biggest clubs in London. Despite our in-roads of late, I would still contend that Arsenal have the biggest fan base of all the London teams. Whereas I think that Chelsea have a bigger global name than Spurs (we have ridden the internet at a key time), I still think that Chelsea lag behind Spurs in the south-east. The evidence in front of me could not be ignored. I received an email recently from the club asking about my opinions about a few topics, but the questions were quite clearly hinting at our thoughts about a move to a new stadium. What a surprise. Well, I fully expect that the club will announce shortly that – “following a random sample of season-ticket holders and members” – the majority of Chelsea fans back a move to a new 60,000 stadium. Excuse my cynicism, but that would be a nimble piece of marketing by Chelsea, pushing through more propaganda in their desire to “up sticks” from our beloved stadium. Well, I will say one thing; it is a shame that more of the same fans couldn’t be bothered to fill 31,500 seats at Wembley. Not many Spurs flags. More Chelsea ones. Dare I mention the silence for the Hillsborough victims? Notwithstanding Liverpool’s wish to avoid playing on the 23rd. anniversary of Hillsborough which then forced the F.A. to schedule us at a ludicrous time on the Sunday before a CL semi-final against the best team on the planet…notwithstanding all that…there was simply no reason for a few fools to besmirch the memory of the 96 fans who lost their lives all those years ago. I glowered at two imbeciles in the row behind me, faces contorted with drunken rage, shouting obscenities. Now is not the time to write about the events of that horrific day in Sheffield in 1989 – and Liverpool fans were not without blame – but it truly saddened me that a minority of Chelsea fans behaved in such a way in 2012. Jose Bosingwa in. Didier Drogba in. Mikel in. Of the two sets of fans, Spurs seemed more audible, though not up to their 2008 levels. The dirge-like “Oh When The Spurs” echoed around the west end, but we couldn’t respond. Our little group of mates, ably supported by a few others in the vicinity, tried our damnedest to get things moving, but we were met with opposition. There were only a few chances in the first quarter for both teams. We were sounding each other out. I feared Modric, but also the pace of Bale and Lennon. Drogba was booked for a senseless challenge and I wondered if we would rue this later. Kalou broke on the left before playing in Juan Mata, but his weak effort was easily saved by Carlo Cudicini, the much-loved former Blue. A Van der Vaart header was cleared off the line by John Terry down below us. In a nervy few minutes, Spurs ought to have gone ahead when a Van der Vaart ball towards the lurking Adebayor bounced up and rebounded off the far upright. Cech was beaten. Had Adebayor reached the ball, we would have been behind. The Chelsea end eventually warmed up and our little gang of rebel-rousers initiated a “Carefree” which rolled around the upper tier; good work, boys. With half-time approaching, the ball was played up to the previously subdued Didier Drogba in a central position. In a piece of classic Drogba action, he spun the ball past William Gallas and pushed the ball to his left. He unleashed a devastating shot past Carlo and the net rippled, sending us into a state of euphoria. Only Drogba could do that. How he loves Wembley. How we celebrated. Miraculously, we were winning. Good old Chelsea. More “Bouncy Bouncy” in the concourse at the break, but I wondered why the same fans felt so inhibited inside the stadium. The second-half began with a flurry of Chelsea chances. Juan Mata soon forced a superb save from Carlo Cudicini and the ‘keeper parried a Luiz header from the corner which followed. There then followed a moment of infamy which will be talked about for ages. The ball bounced back towards Juan Mata who prodded the ball towards goal. The ball seemed to hit a cluster of players on the line and before any of us reacted, Mata celebrated and the referee was running back towards the centre-circle. I quickly glanced towards the linesman, but his flag was not raised. More manic pandemonium in the upper east end. Oh you beauty. We could hardly believe this. I noted that more than a handful of Chelsea fans, enjoying half-time refreshments, had missed this goal; fools. Within what seemed like a few moments, Spurs had pulled a goal back. A ball from Scott Parker, the scowling former Chelsea midfielder, played in Adebayor. A clumsy challenge from Petr Cech but the ball rolled out to Bale who neatly turned the ball in to the empty net. The west end roared; that was more like it Chelsea, things were going too bloody well. Unfortunately, David Luiz, who had been reasonable, had been injured during his attempt to block and was sadly stretchered off. Gary Cahill replaced him. Chelsea then enjoyed lots of the ball, moving the ball very well and keeping possession. The midfield were great – pass, pass, pass. We stretched them out if we could, Ramires especially doing well. Cahill did ever so well to track back and put in a sublime tackle on the raiding Bale. This was clearly a great game now. I watched on with a nervous resilience. Juan Mata spotted Ramires’ fine run and, as Carlo advanced, the little Brazilian dinked a gorgeous chip over the advancing Number 23. The ball dropped in to the goal and bodies all around me were flying everywhere. Soon after, Gallas (yes, him) fouled his nemesis Drogba and Frank Lampard placed the ball. From my viewpoint, the distance seemed too far for a shot on goal, but I had my camera at the ready in any case. Surely he wouldn’t go for goal? The ball flew past Carlo and we were 4-1 up. Thousands of Spurs fans left en masse and I couldn’t resist taking many photographs of this perfect picture postcard scene; the scoreboard plainly stated Tottenham 1 Chelsea 4, the setting sun was disappearing behind the upper reaches of the west end and with it, Spurs season. The west end turned red. Florent Malouda and then Fernando Torres came on as late substitutions and more chances appeared as we caught Spurs flat-footed at the back again. In the fourth minute of extra-time, with the Spurs support down to around 2,000, further joy. That man Mata, below his best these past few weeks, clipped the ball through for the onrushing Malouda who calmly stroked the ball below the hapless Cudicini. Tottenham Hotspur 1 Chelsea 5. We – of course – couldn’t believe it. This was as an unexpected win as I have ever known in over 38 years of attending matches. Before the match if someone had said that the result was going to be 5-1, there is a very strong chance that I may have expected a Spurs win. I was not present at the 6-1 win at 3PL in 1997, so this represented the biggest ever Chelsea win against Tottenham. Oh boy. We said our goodbyes – “see you Wednesday” – and we joined in the songs on the triumphant walk down the many flights of stairs. There was a definite case of “we don’t believe it” as we exited the stadium, shaking hands and hugging friends, almost delirious with glee. The joy continued as we slowly trudged along Wembley Way. I kept looking behind to see the illuminated arch lighting up the darkening sky. This was a lovely sight, witnessed by myself for the first time – I have not been a fan of new Wembley – but this iconic sight struck a chord. The clear night sky, beaming Chelsea faces, the cold April evening, the arch towering over all. Parky, Jake and I headed back into town. I was absolutely starving as I hadn’t had anything to eat all day long…we ended up, predictably, at Earls Court where Salvo entertained us with the perfect denouement to the day’s action; an Americano pizza with extra anchovies and a single ice cold Peroni. I eventually reached home at 12.45am – it had been a magnificent day in London. Easily one of my top ten favourite matches of all time. For Tottenham, it was their sixth consecutive semi-final defeat. I joked with Parky on the way home that even though we sing “we hate Tottenham”, I am sure that they hate us more. Let’s keep it like that. We now play Liverpool at our second home on Saturday 5th. May – our fourth F.A Cup Final in six seasons. Tottenham, meanwhile, look wistfully on. This entry was posted in Season 2011-2012. and tagged 1981-1982, 2007-2008, 2011-2012, Didier Drogba, FA Cup, Frank Lampard, Hillsborough, London Football, Roberto di Matteo, Tottenham Hotspur, Wembley by Chris Axon. Bookmark the permalink.